For over 50 years, John (JC) Greene (aka ‘English’ John Fox) has been passionate about and involved with, all aspects of music. Brought up in the '50's in a small town in Cornwall, UK, badly educated and repressed by his Methodist parents, music provided the escape he needed. First through radio and records, Elvis, Ray Charles, Roy Orbison, The Beatles and The Beach Boys and then into local bands. Leaving school at 17 he was forced by his father into clerical work but after 2 years of this tedium he left for London. The city was everything he had dreamed it would be and in short order he discovered the wonderful, hippie, world of that time. Bands, drugs, women, The Roundhouse, Eel Pie Island commune, Europe, the first Glastonbury Fayre (he played on the first Pyramid Stage and dug the toilets ! ), Morocco, broken hearts and music, music, music. In 1971, on the rebound, he arrived at the door of the, then, hot music venue Rainbow Theatre, in London, looking for work and within 2 weeks became the assistant stage manager. The place was run on the Bill Graham inspired lines of The Fillmores and he immediately connected with the California work ethic that was in place there. It felt like coming home and he learned the backstage business fast, all the time soaking up the knowledge that proximity to great musicians can provide. When the venue closed he was offered more work by the production company that came from its ashes, firstly the Wings Over Europe tour, then the Grateful Dead, then Santana. The Santana crew especially befriended him and invited him to accompany them to San Francisco when the tour ended. Four years in the USA followed, a blur of touring with Santana, The Dead, Boz Scaggs, The New Riders of the Purple Sage, The Allman Brothers, Commander Cody, Steve Miller, The Tubes and many others. He got to see the whole country and fell in love with the West and California and Hawaii in particular, drinking in the music at every turn. By the late seventies he had had enough. The adventurous spirit of the previous decade had dissipated, business was the order of the day and he rebelled again, deciding to return to his roots in Cornwall. Whilst making this huge decision he found himself sitting near North Beach Marina in San Francisco one day, with a pad of paper and a pen and was surprised to realize he had written a song ! The culture shock of the return to the U.K. was staggering. Everything was different. The weather, the people, the lack of adventure but he stayed, married (twice), had 2 children, sailed and set about applying what he had learned to the music scene he found there. Songwriting took a back seat for a long time because of the impossibility of recording. Times were hard in Thatchers' Britain and just surviving was hard enough, though local band work of all descriptions kept the wolf from his door. By the mid 90's a combination of improved fortunes and good luck led to his recording his 1st album, 'Gone West', a collection of favorite songs learned on the road recorded with an art student band who would later gain fame as Derrero. A second, this time mostly self penned, CD was released in 1998. 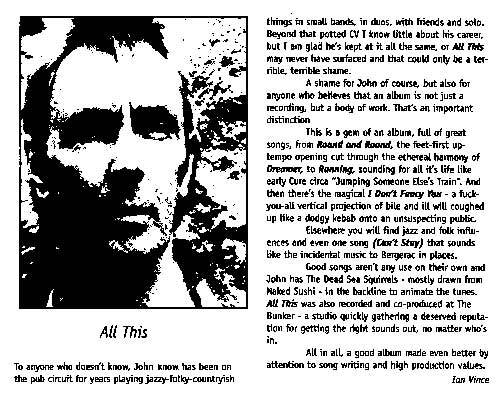 Titled 'All This' it featured some of the best local musicians of the time. Then came the home studio explosion and a small inheritance and suddenly songwriting had an easier outlet. 'A Different Game'(2003), 'Time To Remember'(2006) and 'West of the Rest'(2009) followed and in the process of recording these proficiency in production, keyboards, pedal steel, ukulele, photography, video editing and website design was attained. His most recent, original, album 'Hard Country' was released in 2014. A collection of country standards in a 'train rhythm' style, 'It Takes a Train to Cry'(2018) is now on release. He currently gigs and records as a singer, lead guitar and pedal steel player. Steve Kellow aka Rogue*Star, Salisbury, United Kingdom. There are so many elements I enjoyed right through 'It Takes a Train to Cry', I found it difficult to pick out a favourite track or three. Initially it was 'Superstition', mainly because of the distinct and unusual feel. There is something very seductive about this arrangement of the song. It is simply beguiling. Then there's 'It Takes a Lot to Laugh', 'Mystery Train' and 'Act Naturally'..... perhaps that's just it, because as an album it works overall on such a cohesive level it makes it extremely hard to pick out individual tracks as ones favourite, rather than the so many great elemental changes of the many rolling songs, which again highlights and marks this out very much as a truly collaborative album, that is far more a whole work of a musicians artistic endeavour and tapestry achieved, than it is A collection of varying and astonishingly different tracks, its no accident then that they all seem joined at the hip! Well done that man !!. Darcy Jeavons, Huntington Beach, California. Very cool songs.....sounds beautiful and clear....wonderful! Matthew Rogers, Station Head Source FM. Your songs are just 'made' for radio. Jenni Chong, Foxton Beach, New Zealand. I am not a country fan, but yours sound great. Good voice. Reminds me of John Lennon. A wonderful song, John, great performance. Woaw ! Good track and a fine clip, I like it ! Come back for listen one more. Hans van der Velde, Leiden, The Netherlands. Dejana Ristic, Belgrade, Serbia And Montenegro. Peter Evans, Wrexham, United Kingdom. A great song and performance, love that slide on the Tele. Bernardo, "Bern" Robles, El Paso, Texas.